Lidd™, a patented and innovative peelable lidding film solution for ready mealsIt’s been announced that HH Global, a global marketing services company, has launched ‘LiddTM', a patented and innovative peelable lidding film solution for ready meals. The new product is designed to eradicate the need for cardboard sleeves, deliver major cost savings for brand owners while also maintaining brand identity and reducing the environmental impact of food packaging. Developed by HH Global in conjunction with Parkside Flexibles (Europe) Ltd., unlike traditional ready meal packaging, the HH Global LiddTM utilises a two layer laminated film construction to not only seal the product, but also displays the usual printed marketing information - allowing branding on the upside and nutritional information on the reverse. HH Global said that this innovative approach reduces packaging weights by over 45 per cent and packaging costs by at least 10 per cent, making LiddTM not only a cost-effective but environmentally friendly solution too. The company also went on to highlight the fact that LiddTM can be used in any environment, ambient/chilled or frozen, on plastic, aluminium or paper/plastic tray combinations. HH Global has been working with a major food group to introduce LiddTM to product lines totalling 100 million+ units per year. The associated packaging weight reduction from utilising the HH Global product is expected to be 600 tons per year, with an expected cost saving of nearly US$1,000,000 per anumn. Tony Massey, CMO at HH Global said: "LiddTM represents a quantum leap in food packaging development. By utilising the new solution, very significant savings can be unlocked across all ready meal product ranges. 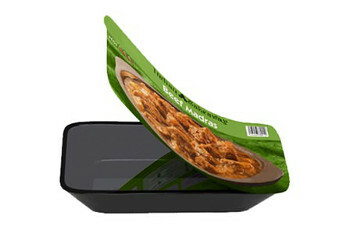 As such, we truly believe that this technology has the potential to revolutionise the food packaging market, worldwide. In addition to reductions in product weight and increased environmental performance, there are further associated reductions in product warehousing and transportation. What's more, the eradication of a cardboard sleeve from the production line also enables LiddTM to reduce traditional manual handling costs and bottlenecks. LiddTM is a perfect example of where a relatively simple idea creates an innovation that makes huge commercial sense. Client interest in this new product has been considerable, and we are working very closely with several large retailers and brands to help them maximise its many benefits." Watch the LiddTM demonstration here.